Great for Saint Patrick's Day events, sports games (football, rugby, etc) to support Ireland and any other type of Irish themed party. 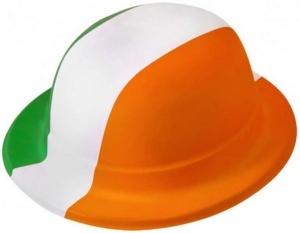 The colours on these hats are those of the Irish flag (green, white and orange). The ideal fancy dress and themed party accessory for any Irish themed event. One size only - fits most teens and adults. Wholesale and bulk buy discounts may be available on these Green, white and orange irish flag bowler hats subject to your required quantity. Please call us to enquire.